From his DTM debut at Hockenheim to the most legendary racetrack in the world: Maximilian Götz lined up at the weekend for the 43rd running of the ADAC Zurich 24-hour race at the Nürburgring-Nordschleife. 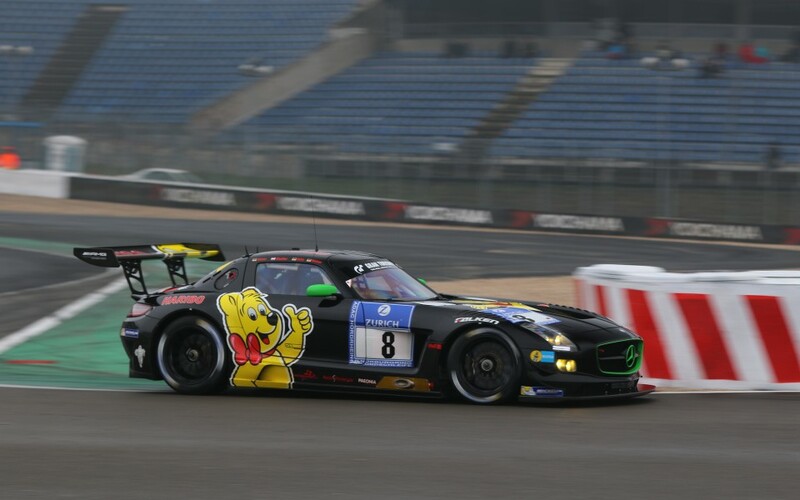 After a promising start, the SLS AMG GT3 fielded by HARIBO RACING TEAM retired after five hours of racing. Maximilian, how did you react to your gullwing’s retirement? I was following the race on the monitor at the time but couldn’t see any picture. I was wondering why our car was heading for the pits, as there had just been a change of drivers. I ran straight to the team garage and saw the damaged car, unfortunately. My team-mate Norbert Siedler had skidded off track in extremely tricky, wet conditions. He got the SLS AMG GT3 back to the pit lane, but the team then retired our car before the end of the race as a safety precaution. What was the mood in the team like? Well, of course, everyone was just as disappointed as me. Norbert said sorry for the mishap, but I told him that it could have happened to any of us. It was just an unfortunate occurrence. Anything can crop up in the wet on the Nordschleife. The failure to finish was a great pity for the team. The entire crew of the HARIBO RACING TEAM did such a great job over the weekend. Unfortunately, they didn’t receive their just reward for all the hard work. What do you think might have been possible in the race but for the retirement? To be honest, we had hoped for a podium finish. The speed of our SLS AMG GT3 was terrific in the race, and the car definitely had the potential for a top result. We had finally sorted all the problems that had occurred previously that weekend. We established ourselves among the top group of cars during the first few hours of racing until the smash ultimately put a spanner in the works. Were you satisfied with your own performance? I drove nine laps in one stint and would have liked to have gone on much longer! I felt totally comfortable in the SLS AMG GT3 and managed very well. I’m really familiar with the gullwing from recent years, you know. After switching to the DTM, the 24-hour race felt a little like ‘back to the roots’. I’ve known a lot of the guys here in the paddock for a long time, and going up against them once again was enormous fun. You will be competing at the Lausitzring on the weekend of 29th-31st May with the Mercedes-AMG DTM team. What are the key factors there? We analysed the Hockenheimring race weekend very closely. I’m sure that we can improve even more, so I’m preparing for my second DTM race weekend, using the simulator and video analysis. The Lausitzring should suit us well. My Mercedes-AMG DTM team-mate Pascal Wehrlein won last season’s race. I’ve always liked driving at the Lausitzring and cope well with the track conditions. The biggest challenge with the Mercedes-AMG C63 DTM will be to get the best exit out of the turns without traction control. The bumps at the Lausitzring are really something. You have to take them very carefully, otherwise the car starts to leap about violently. The circuit is relatively short, so the field should again be bunched close together.